A photograph of preparations for an Anti-Nazi exhibition shown in premises in Regent Street, London, taken by Calcraft for the Daily Herald newspaper on 3 July, 1942. 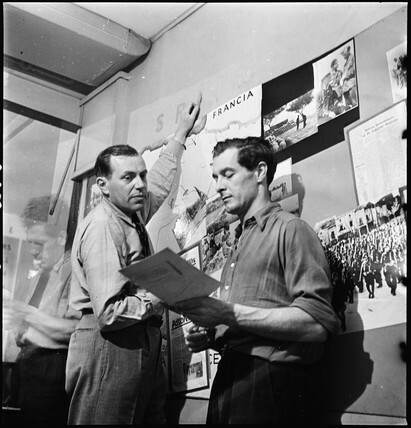 The two men putting up maps and photographs are Hans Kahle who commanded troops of the International Brigade during the Spanish Civil War, and the painter and sculptor Rene Graetz. 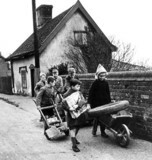 This photograph has been selected from the Daily Herald Archive, a collection of over three million photographs. The archive holds work of international, national and local importance by both staff and agency photographers. Children in a hop field, 1941. Children drawing on the pavement, 1941. American troops marching through London, 1942.